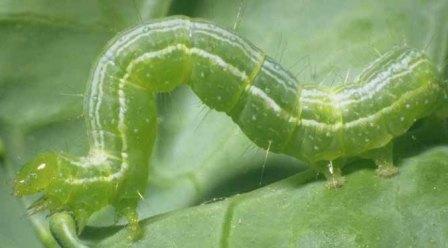 Region: this Caterpillar can be found in the United States and Canada. Life cycle: This insect produces several generations each year. Winter is spent as a pupa attached to a leaf. The adult emerges from the pupa in spring as a brown moth. Although, in northern regions adults may south for the winter. Physical Description: This 1 1/2 inch long caterpillar is green with pale stripes down the back and is identified by the characteristic way he humps along like a measuring worm. The adult is a brownish moth with a silvery spot in the middle of each forewing and flies at night with a wingspan of 1 1/2 inches. The isolated round eggs are a greenish white and are laid on the upper surface of the host plant leaves. Feeding characteristics: This pest will attack bean, broccoli, cabbage, cauliflower, celery, kale, lettuce, parsley, pea, potato, radish, spinach, and tomato plants, by chewing the leaves. Controls: The Trichogramma Wasp is a natural predator that can help control this caterpillar. For serious infestations, use Bacillus thuringiensis or dust with sabadilla.